The Smith's Shipment - The blacksmith Tuatanu in Golden Valley has asked you to look for his missing shipment out. At the southwestern edge of the map you will find the overturned carts (4), with the missing cargo was transported. Follow in the footsteps north until you come across a bandit camp (6). Once you have defeated the bandits you can recover stolen goods in the case of the blacksmith. Return to Golden Valley back and reported Tuatanu of your success, to complete the quest. 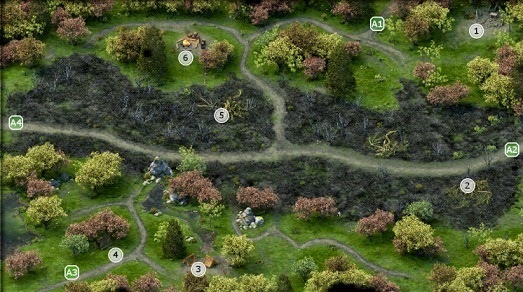 If you come from ester forest, then begin in the northeast of the map (A1), from where you first go further east to the edge of the map and you should fight against the two forest lurker. Then you can at the monument Galawains (1) in a hidden. Discover treasure in the chancel, which includes a good wand, a scroll of fire beam, a scroll of chaos walk and 64 silver Lusce. Now go south and you will meet gradually over four forest trolls and two dragon skeletons. The southerly of the two skeletons (2) win at a later stage in the quest "The Parable of Wael" important, but will be ignored for the moment. Turn on the eastern card output (A2) Caed Nua free as a destination before you continue in the Shipment. March on south until you hit on eight specific gravities and a dead adventurer, extends your Fulvano set for a pair of boots. Make your way then, once their southern Pillars of Eternity: Solution to quests, boss battles, territories - Ester Forest. Have reached edge of the map westwards. On the way you will meet two spear spiders and four young spear spiders, and possibly a round-scattering forest troll. Kill them all and enter following the camp in the south (3), with the two dead adventurers. The corpses for example a good battle bow, remove a potion of mysterious Protect and 19 gold Suole. Also, you can find a hidden treasure in the sand: Potion of Regeneration weak, camping supplies and 21 gold-Duc. A little further west you will find an indication of the cargo, which missed the blacksmith Tuatanu from Val d'Or. You find there the carts (4), with which the shipment was transported - he is overthrown, and are riddled with arrows. This obviously has been a robbery. However, survivors ye see not, and no clues to the whereabouts of the goods. Makes a detour to the south-card output (A3) to win the Madhmr Bridge on the world map as a destination and then emigrated to Pillars of Eternity: Solution to quests, boss battles, territories - Ester Forest & The north. Approximately in the center of the map, there is a third dragon skeleton (5). If you're interested in to complete your bestiary, you can now defeat in the North West nor the three forest trolls. Otherwise, you should aim for a piece of the north and bring you down there in the fight with three bandits, a plunderer, a wicked and a bandit leader of the dragon skeleton of the Bandit Camp (6). Do you have defeated them, so you can facilitate not only their equipment, but also plunder the surrounding container and so in addition to money, some weapons and potions find the missing box of Smith Tuatanu. You can now travel back to Golden Valley and there complete the quest "The blacksmith delivery", by talking to Tuatanu and give him the box. In return, you get experience points, 100 pieces of copper, the Grand Shield pantry door and your reputation in Golden Valley improved. In addition, the blacksmith has released new items in the range.